“Even youths grow tired and weary, and young men stumble and fall; but those who hope in the Lord will renew their strength. 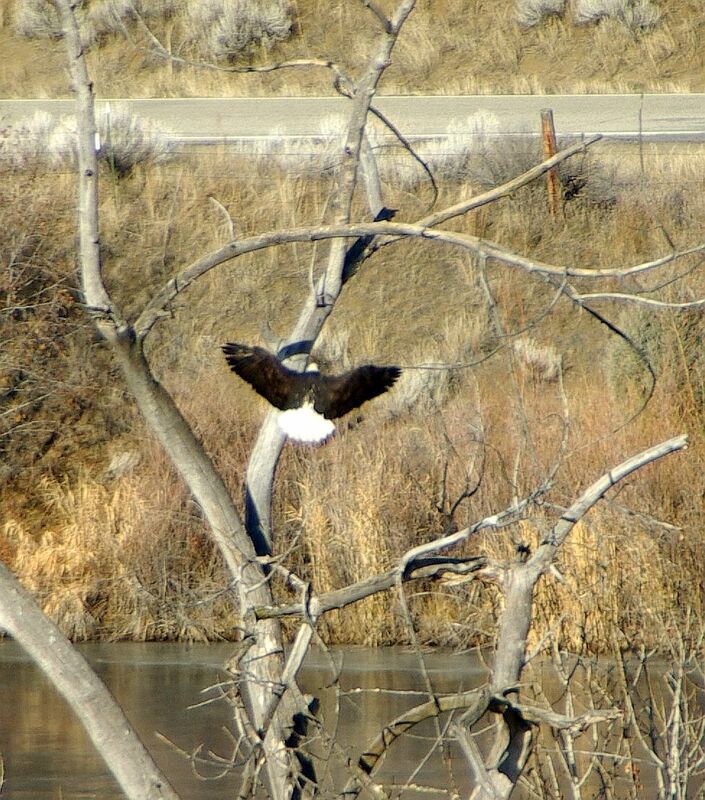 Bald eagles: They are elegant, have a dignified air about them, and symbolize this great land. Growing up in California, I only saw them in pictures: regally flying against an azure sky or with the American flag as a background. I always wondered: what kind of camouflage does a stark white head and brown body provide? Up against the sky: not at all. We saw them in Alaska, flying after a fishing trolley, and while they dove and fluttered madly against a slate-gray sky and a dark green sea, they still stood out with great abandon. 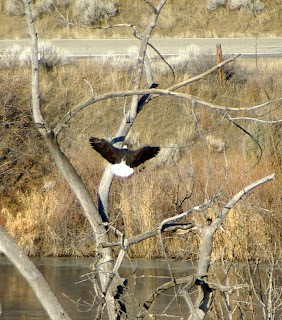 It wasn’t until I moved to Idaho that I saw them in their element: along the river, up in skeletal trees in the winter, with patches of snow everywhere, did I see the beauty of their coloration--dark shadowy brown and stark white against a background of dark shadowy brown and stark winter white. The road we viewed them from is above the river, so we were looking down upon them. They sat in the trees, surveying their domain, and while they seem to be ruling it, they also were a beautiful part of the larger terrain as it stretched out before us. 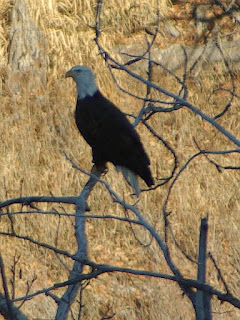 One day, I was able to pull my car to the side of the road, roll down my window, and see an eagle up in a tree, against the dark gray and blue sky. 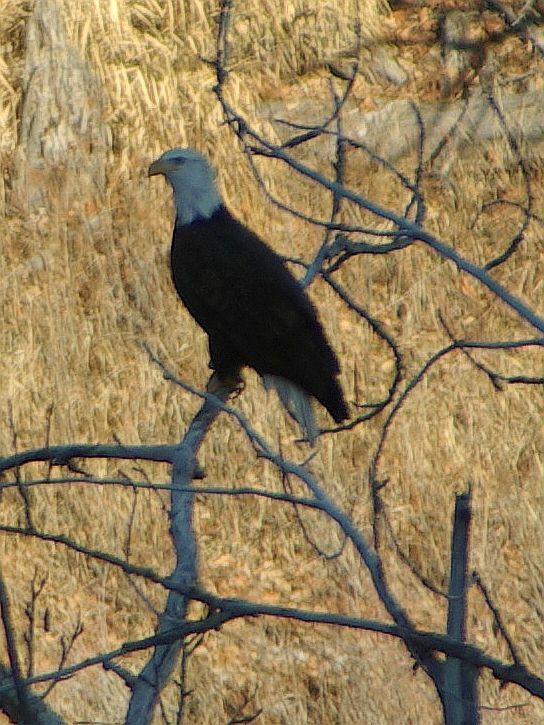 He turned his head, and I saw those wonderful yellow eyes, staring down with a look of, “Yes?” I was so excited, I told one of my neighbors, and he said that the local cows who are currently having babies, will eat the afterbirth, and what they leave behind, the eagles will swoop in and finish. Suddenly, it hit me: what seemed out of place, has a place, in His plan. The colors of the eagle allow it to blend into landscape of winter, and when it is flying against a blue sky, the eagle’s mightiness is enough to protect it. Sometimes I wonder, why do I look and act the way I do? I am a product of my DNA as well as my childhood, and sometimes, I don’t like what I am now. I grow weary and ask, is there any good I can do? Really? But, if I try to see myself from the road above the river, I have characteristics that He can use, in His grander scheme of things. Weariness sometimes comes from not knowing if our lives are making any difference. Perhaps we think we are not good enough—but ask yourself: Do the eagles know how well they blend in? Or how mighty they look as they fly? No—probably not. Do I know what effect I am having on others as I try to walk in the Lord, sharing Who He is, in me? But I am in His landscape, and He will use me to further His plan. That idea alone fills me with renewed strength for the days ahead. Precious Lord: Help me to trust who I am as I walk in You. I feel that I stand out, in a not-so-positive way, and yet, in the wider landscape of Your world, I am doing just fine. Let me confess sin, for that alone will tie me down to the to the earth. Then let me soar, confident that You have a plan, and that I am in it. In the Name of the One Who never rests and Who is always causing me to take wing, amen.